Party backed youth wing has accused Hill Trinamul Congress of abducting two JAP Kalimpong College class representatives (CR) and keeping them hidden in a hotel at Second Mile today here in Siliguri. Trinamul Congress, however, have denied the allegations. As informed, the JAP activists came to Siliguri this morning in search of the two CRs. They found a room in a hotel at second mile was booked in the name of Hill unit of Trinamul Congress spokesperson, Mr Binny Sharma,where the two CRs namely Manisha Rai and Papu Bishwakarma were kept. Meanwhile, some JAP activists went to the residence of state tourism minister Gautam Deb in Siliguri seeking his intervention. But Mr Deb was in Kolkata at that time. JAP representative believe that both the CRs will be taken to Kolkata where they will be switched from JAP to the Trinamul. "We are happy that chief minister Mamata Banerjee upgraded Kalimpong to a district. But we are disappointed with the role of a section of the party's leaders.During the college election on 14 December last year, JAP had bagged 12 out of 22 seats.Ten seats had gone to Gorkha Janmukti Morcha backed students' wing. But on 15 February, six CRs switched to Trinamul. 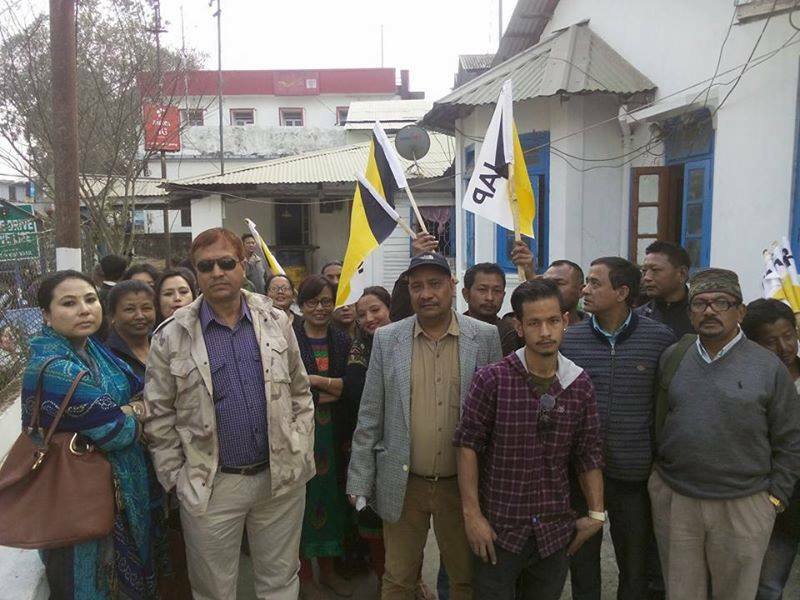 The ruling party could not secure five per cent votes in the college election,yet they are trying to form a board," said JAP youth wing chairman Mr Pankaj Chettri. "If the two CRs have decided to leave JAP on their own,we have no issues.But we will condemn and agitate against any activities of the Trinamul that suggest that they want to form the board by dissolving the present one," claimed Mr Cheetri. The party has maintained that they have enough evidences to prove how the Trinamul are luring the JAP CRs to join their party so that it can form a board through unethical means. "We will release the evidences in 48 hours if required," Mr Chettri added. Further the JAP representative put suspicion on whether the state government will use such methods in the upcoming municipal and panchayat elections.The party’s legal cell will take legal steps on this issue, they said.The JAP president Harka Bahadur Chhetri said the Trinamul youth leader Pranay Thulung had taken the students to Siliguri and kept them at a hotel. "Today our party supporters went to Siliguri and inquired about the fact.We have the evidences.They neither did secure five per cent of the votes in college election nor bagged even a single seat,but with money, they are luring the class representative of other parties," said Mr Chhetri. He further said the Hiil unit of Trinamul was acting against the principles laid down by chief minister Mamata Banerjee. He asked that when Trinamul is targeting the college unions,what will happen in other polls. 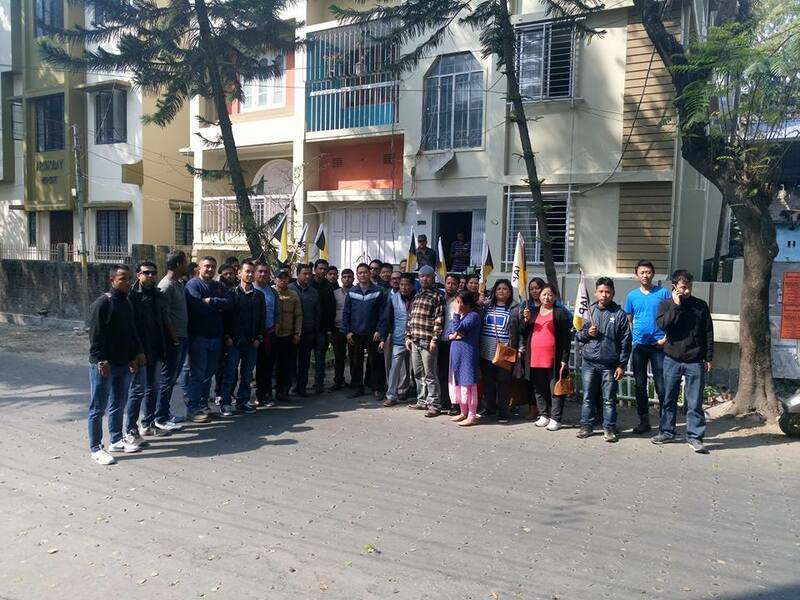 JAP staged a dharna in front of Kalimpong police station today. The party demanded to bring back Manisha Rai who is missing from the past few days and her family is very tensed. Meanwhile,Pranay Thulung, when asked about the allegation made by JAP, said that he did not know anything as he was in Kolkata to attend party meeting. The spokesperson of Hill Trinamul Binny Sharma rubbished the allegations against the party. "The groundless allegations have been levelled against us to malign the image of the party.The duo have already joined Trinamul Congress.We have evidences to substantiate the claim," Mr Sharma said. 0 Respones to "JAP’s youth wing accuses Hill Trinamul of abducting its 2 CRs"